How about your dreams become true with the help of a genie who is a beautiful blonde girl? If this appeals you, don’t miss this slot game. 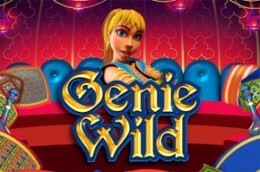 Genie Wild is an online video slot wih an unique Arabian theme and related graphics and symbols. This game is a 5-reels slot with 25 paylines that was brought to you by Microgaming software developer. The game offers to its players multipliers, free spins, scatter and wild symbols. Genie Wild is playable on all devices including PCs, Macbooks, tablets and smartphones, iPads and iPhones. The main symbols are a green gem, a bowl of fruit, a chest with gold coins and a monkey. The lower value symbols are represented by the standard playing cards (9, 10, J, Q, K and A). The scatter symbol is a bottle and the wild is the genie.